Climate Justice is the work we do to confront the climate crisis. While Washington State is a small proportion of the world population and economy, there are actions we can take to show leadership in solving the climate crisis. 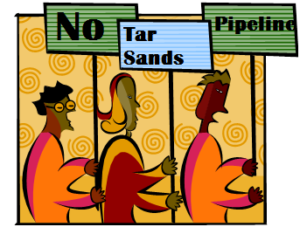 Some of the major issues we confront are listed in the menu item “Our Work.” Recent changes in the state’s action on climate can be seen in the news items posted below. Also, follow current legislative activity that we are tracking at our Carbon Pollution Accountability page in the legislative advocacy section. Climate change affects all of us, but its consequences are not distributed equally. Climate impacts exacerbate existing inequities in society, whether they are related to poverty, gender, race or ethnicity, ability, or other factors. The slow-onset impacts of climate change are displacing communities and having severe impacts on human rights — the right to health, food security, water and sanitation, life, religious expression, and culture, among others. 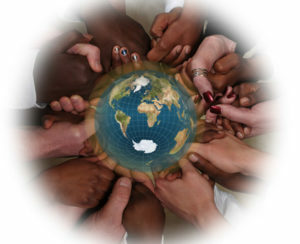 Often, grassroots, frontline communities have the best and most appropriate solutions to these challenges. At the same time, these communities receive the smallest share of funding and are sidelined by state and international decision makers. BY ANNETTE CARY APRIL 14, 2019 11:48 AM, UPDATED APRIL 14, 2019 12:10 PM Criticism of speeding up a study looking at removing the Lower Snake River dams smells like an attempt to undermine the study’s validity, says Tri-Cities Congressman Dan Newhouse. In October 2018 President Trump required that a new environmental study on management of the Columbia and Snake rivers hydro system be completed a year sooner than previously planned. The study now is scheduled to be completed in September 2020, before Trump’s current term of office ends. A decision on how to best operate the hydro system is expected to be made based on the study . Trump ordered the shortened schedule as part of an initiative to streamline regulatory processes for water projects in the West. In 2016, a federal judge in Portland overturned a 2014 management plan for the dams, finding it did too little to protect salmon runs, and ordered a new management plan, called a biological opinion, or BiOp, be adopted by September 2021. 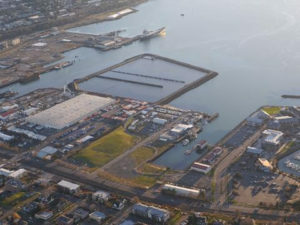 The environmental study being done for the new BiOp includes the option of tearing down Ice Harbor, Lower Monumental, Little Goose and Lower Granite dams in Eastern Washington. Read more here. 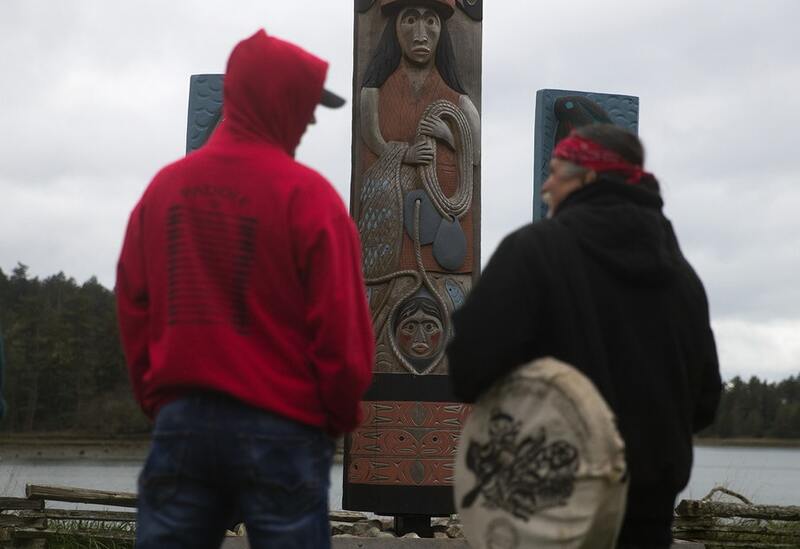 Lummi Tribal Chairman Jay Julius, left, stands with Jewel James after a ceremonial feeding where one live chinook salmon was released into the water, on Wednesday, April 10, 2019, on San Juan Island. Lummi tribal members released one live chinook salmon into the Salish Sea on Wednesday as a spiritual offering to J17, an orca matriarch who has been ailing. . . . 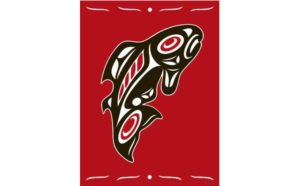 The tribe wants all the southern resident orcas to fare well, but there’s one in particular they are worried about. J17, also known as Princess Angeline, has recently shown signs of emaciation. Scientists say she may not survive the summer. Lawrence Solomon, tribal secretary of the Lummi Nation, led the morning with the Lummi National Anthem. Read more here. The Washington State House of Representatives Capital Budget Committee released its capital budget, which includes $42 million in the Clean Energy Transition Fund (Clean Energy Fund IV). Unfortunately, the Senate budget, SB 5134 omits much of this funding. The Senate Ways and Means Committee has approved the budget and forwarded it to the Rules Committee. You can take action by clicking on 5134 and clicking "Comment on this Bill." You can learn which items are affected by reviewing a list of the items omitted or reduced, which can be found here. The information below was provided by the Clean Tech Alliance, and is reproduced with their permission. The House appropriations are provided solely for projects that provide a benefit to the public through development, demonstration, and deployment of clean energy technologies that save energy and reduce energy costs, reduce harmful air emissions, or increase energy independence for the state. Priority must be given to projects that benefit vulnerable populations, including tribes and communities with high environmental or energy burden. What are the risks from genetically engineered fish to the people and environments of the Pacific Northwest? We tackled this question head-on with our short film Salmon People. Town Hall Seattle and Community Alliance for Global Justice (CAGJ) join to screen this powerful new film and call together a panel of indigenous and advocacy perspectives—all key activists working on Northwest Native food sovereignty and justice in the Pacific Northwest. 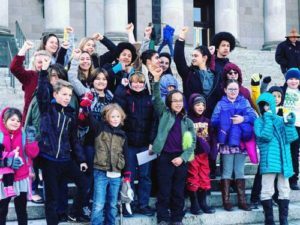 Four climate bills have been introduced, passed committees and passed at least one chamber of the Washington State Legislature. They involve “Clean Energy” (100% renewables for electricity), electrification of transportation (incentives for electric vehicles), “Clean Fuels” (reduced fossil fuels in fuels), and hydrofluorocarbons (highly potent greenhouse gases). The"Clean Energy" bill, the hydrofluorocarbons bill and the electrification of transportation bill have passed the legislature but the clean fuels bill has strong opposition. Since Puget Sound Resident Orca Mother Tahlequah carried her deceased calf for 17 days, a message of urgency about the dire conditions faced by her pod, Backbone Campaign has mobilized banners, light projections, and eight Human Orca Murals across the State. Our hope is to double that number by June 1st. If you want to create this in your community, let us know. Upcoming Orca Murals are planned for Wenatchee, Spokane, Olympic Peninsula, Bainbridge Island, and more! WATCH a short video of the Orca Mural in Astoria, Oregon. The House and Senate have passed ESHB 1578 and it is likely to be sent to the governor soon. This bill specifies permit requirements for oil tankers, requires tug escorts, assesses threats of oil tankers to Orcas and other wildlife in straits. It passed the House 70-28 and the Senate by 32-13. January 1, 2024, for centrifugal chillers and positive displacement chillers. 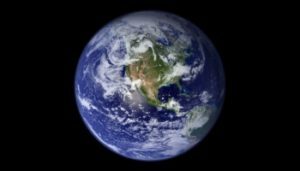 HFCs were substituted for chlorofluorocarbons (CFCs) after the Montreal Protocol phased them out in the 1990s, but it was discovered that HFCs have a high warming potential. In 2018, members of the Montreal Protocol amended it with the Kigali Amendment to phase out HFCs. Oil companies, big polluters, and the GOP members of Congress in their pockets are doing everything they can to smear the Green New Deal and deny the devastating effects of climate change in order to protect their bottom lines. But a grassroots movement, led by youth activists from the Sunrise Movement, is fighting back and ready to make climate and the Green New Deal a centerpiece issue for the new Congress and in the 2020 election—including holding a nationwide student walkout this Friday to support action on the climate crisis. There is no time to waste. 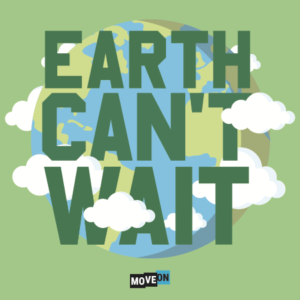 Join MoveOn in showing your support for the Green New Deal by ordering your "Earth Can't Wait" sticker now, placing it somewhere visible, and sharing the message with your family and friends. Thanks for all you do. Scientists and policymakers have long known that black and Hispanic Americans tend to live in neighborhoods with more pollution of all kinds, than white Americans. And because pollution exposure can cause a range of health problems, this inequity could be a driver of unequal health outcomes across the U.S. A study published Monday in the journal PNAS adds a new twist to the pollution problem by looking at consumption . . . Read more here . . .